Sitting in the backyard yesterday after pulling weeds and deciding what we needed to do to get our garden in shape for spring Noelle asked me what was wrong. I guess I was looking down or something. I dunno. She asked me what I had done that day. I told her. It was a great day productivity wise but something was nagging on me. I had taken a rendering to it's final stages and it looked good, weeded the front yard and done some work in the back, and checked a ton of stuff off of my to do list. "well what else did you do"
"I wrote in my blog"
We both laughed our asses off. It just struck me as funny. Yesterday I gushed about my utter joy et all and then proceeded to have one of those blech days. Maybe I put my day's allotted happiness into the writing and that left me dried out. I don't know. Either way, it was a great laugh. 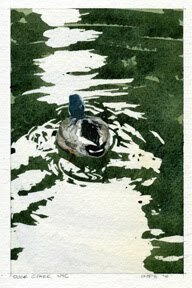 Here's a little duck for Thursday.He seems happy enough. Isn't that almost always how it goes? I suppose it's so we don't take it for granted.